Source: CICH graphic created using data adapted from the Public Health Agency of Canada. 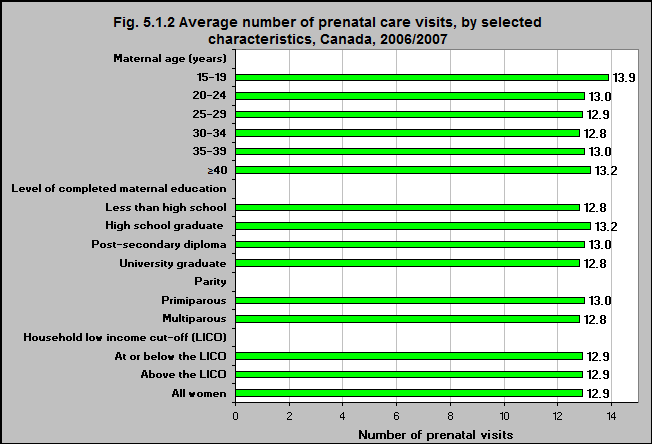 What Mothers Say: The Canadian Maternity Experiences Survey 2006-2007. Ottawa, 2009. http://www.phac-aspc.gc.ca/rhs-ssg/pdf/tab-eng.pdf -accessed July 24, 2017. In 2006/07, there was little variation in the number of prenatal care visits according to maternal age, level of education, parity or income.